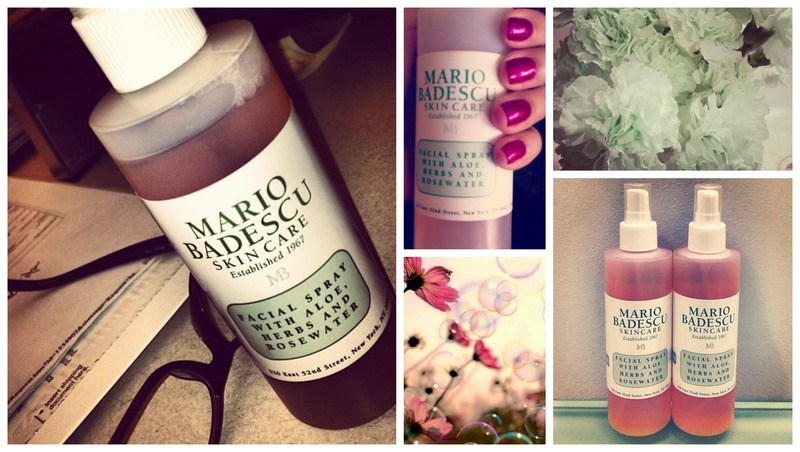 Have we mentioned lately how much we LOVE your #mariobadescu Instagram pics? Facial Spray with Aloe, Herbs and Rosewater! To win a full-size bottle of the facial spray, leave a comment on this blog! We’ll announce the winner on Monday! Contest runs from April 5-April 7th, 2013 and is open to residents of the U.S. and Canada. I want to try this. I just got an order in the mail, my next order will hopefully include this! I love this stuff, I use it to set my makeup which gives a very dewy and glowy look. I love Mario Badescu. I want to try it. I use this every day to set my foundation and powder! I love the idea of this facial spray! I would love to win, I love your products! this looks pretty amazing! I’d love to try some! I learned about your products through a friend … now I’m obsessed! So wonderful to find products that encourage healthy skin at an affordable price! I will love to win. i would love to try this! aloe rose water and herbs are the best! i havent gotten my free samples of mario badescu or have never tried any product this product would be good try especially a full size botttle! This facial spray is the best stuff ever! My go to spray from getting up in the morning to setting my makeup for the day! Makes me feel so good! Thanks MB!!! I love your products and would love to try this one! Love this rosewater spray! Enhances my Ginseng Moist moisturizer! I’ve recently started using Mario Badescu products. Love them! I love how they really work and are still affordable. I have really been wanting to try this one out. I love this facial spray, I use it every day to set my makeup. And it smells fantastic!! I love Mario Badescu products. I would love to win the facial spray!! I just started using MB products a couple of weeks ago and I love them, I cannot stop trying new products! I would love to try this spray!!! Just bought a bunch of Mario Badescu products–already in love! This spray looks just lovely! I would love to try it! I fell in love with this line of products after I had gotten free samples! Would love to get more. Makes my day so refreshing and brightens me up! I have only heard positive comments on Mario Badescu products. Would love to try anything! The rosewater is a mist of heaven! I love my rosewater. When your skin is feeling like a desert just mist a bit of heaven on your face for a refreshing boost of moisture in a subtle way. I also use a few sprays on my makeup sponge before applying my foundation. I’m so glad I discovered this line! I have the super collagen mask, AHA botanical body soap, special cucumber lotion, and silver powder. I would love to try this product! I would LOVE to try this, and any of your line. I was just at ULTA the other day and spent a good 20 minutes speaking to the saleslady about your line! I love Mario Badescu products! I would love to try this spray! I recently started using your products and love them! This is perfect for our hot California summers! I keep a sample in my gym bag. Can’t find natural products for your face these days thank goodness for Mario Badescu! I use the seaweed and flower & tonic products in your line as well as others and have had great results even with very sensitive skin. I would love to try your facial spray. Thank you. I use the cucumber and enzyme lines– but I’ve been dying to try the Rosewater. Mario Badescu beauty products are my ABSOLUTE fave. I would love to win a bottle! Thank you! I love the products of the Mario Badescu line! Thank you – have a good weekend! I really love all my new Mario Badescu products! My skin has never looked so healthy! I need more mario in my life! I love ALL M B products, I use them day and night!! I am excited to use the rose water, I know it is on Martha’s picks, so I can’t wait for my next order! This is PERFECT for summer especially to refresh your face in humid weather. Oh wow, this stuff looks awesome! I am in love with mario badescu products and would be elated to try this one out!!!! Thanks for doing this sweet giveaway!! Love your products! Seaweed night cream is amazing!!! I desperately need this in my life!!!! Haven’t tried this but would love to! All the products I’ve tried have been fantastic! I would love to try this facial spray. I’ve been wanting to try this!! I just got an order in the mail this afternoon of other products. I have been wanting to try this. To win it would be perfect. I would love to win this! I absolutely love all my mario badescu products and i’ve encouraged all my friends to use them! Have been using MB for a while and order items online for family use. Love that MB provides free samples for trial use. However, my last order arrived with no samples which was a real disappointment. Anyway, love many of their products suitable for use on sensitive skin. Love the facial spray the smell is divine and it leaves you feeling refreshed! Love your products!! Would LOVE to try this! Mario Badescu has changed my life. My New Years resolution was to take better care of my skin since I will turn 40 this year. Ever since I have been using his skin care line, people compliment me on how beautiful my skin is and can’t believe I will be 40! Love all your products and tell everyone about them. Do thrilled the last few years I’m able to get some locally. This is on my next order’s to-try list! I would love to try this product 🙂 Everything else I have tried so far has been fantastic..
Love Mario Badescu products! I have not tried this but would love to. I know it has to be good ’cause the rest of the line has been great! I would love to try this…the Mario Badescu products I’ve tried so far have been pretty good! I love all your products! I would be so excited to win the facial spray! Would really love to try this. I have rosacea would it be good for my sensitive skin? I use this every morning to set my make up. Love it! I love this spray…I keep it in the cooler at the beach…so refreshing! I love the products of yours that I have tried, and would love to try this one! Just love the way my face feels after I apply the Cucumber Special Lotion.. It’s so refreshing! I absolutely love this product!! I want to try this!! I love this product 🙂 I use it everyday in my face before makeup . And at nigth I use it in my hands, my hands feel so soft and hydrated…. The Spray smells dreamy and is really refreshing !! My daugther use it under her eyes for dark circles ( really works for this ) . Is a Love affair between my family and Mario Bedescu products hahaha. We love them , my son for his acne and my daugther and I for beauty !! I love the Mario line of cleansers. I’ve been using them for a month and notice a big difference in my roseacia outbreaks. I tell all my friends and family that its a miracle worker. I can’t say enough about these products. Thank you! Ohh Looks & sounds refreshing! Thanks for the chance to win this! I would Love and Use this VERY Talked about Multitasking Spray/Mist because I heard it can even be used to set your makeup and it’s 100% Natural! I am new to Mario Badescu products and I love what I’ve tried so far. I’d love to try the spray. This stuff is the best. Smells delcious and so refreshing! I want to try this! Sounds great! I love the Mario Badescu product line, but my fav is this Facial Spray with Aloe, Herbs and Rosewater! It keeps me cool in the summer- but did you know it can also be used as a make up setting spray? Way to go, Mario Badescu! Thank you for coming up with a product that hydrates my skin without making my rosacea bright red! Would love to win this and try it! I just purchased the enzyme cleanser and the cucumber cleansing lotion! I love Mario Badeacu products and I’m looking forward to trying the facial spray! This sounds invigorating I would love to try it!!!! I would love to try this! Hope I win! This is on my list of items I would love to try! I am loving the samples I got in the mail, will probably purchase a few items next week!! This looks so refreshing, especially as the the weather is getting warmer! I would love to try this. It looks so soothing to the skin. I started use your products a month ago. I really like your facial soaps & am excited about trying other products. This looks fabulous! I have not seen this product at my local Ulta. There is Noting Better than to spritz your Face with some Aloe & Rose Water, it’s so Soothing and Refreshing on the skin! I would Love to Win This! Mario Badescu is the BEST! I practically live by these products and without a doubt would not change them! You guys have the best customer service as well! Love the rose facial spray very much. I’m a sucker for anything rose, and this would be a perfect treat for the hot weather this Californian summer promises. I would love to win because I just tried some of M. B. products and I LOVE them…I’m sure that “Facial Spray with Aloe, Herbs and Rosewater” is a great product too! Hi! I love MB products 🙂 I have tried the enzyme cleansing gel, rosewater spray, glycolic acid face wash, glycolic acid toner, and silver powder so far (That’s a lot! lol).I love the simplicity of the packaging and high quality of the products itself. Although some of the MB products are expensive, I am so satisfied with every product that I have purchased. I am dying to try out more products from you guys and I would love win the facial spray! Would love to win one! I have never been disappointed with your products. I love Mario Badescu products, just so sad I am unemployed right now so I can’t afford to buy one..But would love to win these, I always want to try Rosewater but can’t find it anywhere. Love, love, love these products!!!! Can’t wait to try it someday~wink! I’ve never heard of a product such as this and it seems like a wonderful idea. I would love to try out this product! I have been enjoying the free samples I got from the survey. THIS PRODUCT LINE IS EXCELLENT. MY SKIN TRULY FEELS LIKE A MOVIE STARS ANYTIME I USE IT. I AM A STRUGGLING COUNSELOR AT THE TIME THAT WORKS FULL TIME AND GOES TO SCHOOL PART TIME. ONCE I BECOME FINANCIALLY STABLE I WILL PURCHASE THIS PRODUCT LINE FOR LIFE AND WILL NOT TURN TO ANY OTHER PRODUCT OUT THERE. CROSSING MY FINGERS THAT I WILL WIN THIS SAMPLE SO MY SKIN CAN GET THE HEALING AND RENEWING ONLY THIS PRODUCT LINE CAN GIVE IT. I’ve had good luck with MB products in dealing with rosacea. My face feels good, and I don’t have to spend $50 on a single product. I’d love to try this spray over my mineral powder. Cool… multi-use product for skin and hair. I would keep it at work for a pick me up. Oh yes yes yes, I would absolutely loooooove to win this! I used to be so fresh faced, my skin smooth and glowing and since reaching my 30s (3 years now) it’s a totally different story 🙁 Dry, tight and redish skin, dull looking 🙁 I want my nice skin back! Looking for a new brand that would help my skin right now, instead of keep using what I’ve been using in my teenage years…!! 😮 Would love to give this a try!!! Would love to win this….just found your wonderful products today at ULTA …..am so excited to try them…bought a ton of them. So happy about the prices! I used to be an origins only person. Just started using MB products and I would LOVE to try this! Control Cream is GREAT! MB facial spray, you make my day! so fresh, so sweet, you are all that I need. when its 80 out, I whip you out. Spritzing away.. ahhh! need i something more? nay nay nay! I use a lot of your products from head to toe! (AHA body wash and lechtin shampoo and conditioner. face care of course) I have had my eye on this for awhile and would love to try it! I love everything Mario Badescu chooses to be. This looks awesome, I would love to give it a try. I had a bad case of rosacea about a year ago and I was looking for a skincare line that would both address my problem immediately and would be safe and soothing for long term use. Thanks Mario Badescu!! My skin has improved a lot and I’m stuck with your skin care line! I’m a Mario Badescu addict, but I must admit I have yet to try this! Can’t wait to win it! Seriously love this stuff! It has been one of the BIGGEST life savers for my skin. I tend to have extremely dry skin (especially in the winter) and a lot of the time my skin gets really dry throughout the day. I can’t apply moisturizer because i have already got my foundation done (and can’t really go without) so I’m stuck with super dry skin. I never really heard of facial mists but I saw one at the Body shop and got it. It seemed okay but cost sixteen dollars and wasn’t all natural. It irritated my extremely sensitive skin! That’s when I found the Mario Badescu Facial Spray on Amazon. I was impressed by how cheap it was. So I ordered it and was so impressed. I found a way to keep my skin hydrated. I am ADDICTED. It keeps my makeup looking good and keeps my skin hydrated. And it’s all natural which is very important to me :). Basically so In love with this brand now. A couple years ago i swore off skin care lines because my skin is so sensitive and everything seems to be loaded with chemicals and irritants. I was very afraid to try out M.B. products but they all seemed so natural. Anyways, This is the ONLY brand i can trust to not mess up my super sensitive skin. I’m so happy now that I found a brand I can trust to be gentle and super amazing. The loveliest rosewater spray just in time for Spring and Summer. Would love to add this to my Mario Badescu collection! What a great giveaway! Would love to try it! Oh my, this is an AMAZING giveaway! I would love to try this, as your products are all just wonderful! Fingers crossed, thank you! Me!!! I’ve been wanting to try this!! I seriously could not live without this product. I just keep re-purchasing it cause it is the BEST. I love to use it as a makeup setting spray, and toner, and just a skin refresher. I use it every night right after I get out of the shower just to re-hydrate my skin while my pores are still open. Definitely one of my holy-grail beauty products! heard about rosewater for the face but never tried it. pls add me to the giveaway! Sounds refreshing! I’d love to try this facial spray. Love love love this product! It gets me through my day! Whenever u hit an afternoon slump at the office, a few spritzes of this always hydrates and refreshes my skin! Never purchased MB rosewater products for at-home regiment, though MB aesthetician Olga (my girl) always “seals the deal” with a spray of rosewater, so refreshing. I’m an MB loyal client, as MB saved my skin which went problematic for the first time ever (at 25!!!) when I moved to NYC a year ago, previously living in primarily suburban/rural environments. My skin is absolutely stunning/glowing (I should share before/after pics, quite remarkable but also quite embarrassing!!! ), ALWAYS refer my girlfriends and mature women alike to MB facials & produces. Best facial & skin care boutique in Manhattan, hands down!!! I love how the facial spray is light, yet very effective. It’s hard to find a product that smells great and isn’t too heavy on your skin. I love this spray! It helps my drastically dry skin feel drenched with moisture. Would love a new bottle! Pick me! I love Facial Sprays, keep one on my desk at all times… would love my next new fave to be this one! My most recent purchase contained the Cleansing Milk with Carnation & Rice Oil, absolutely love it! A new staple for me! Customer for life here! I heard of your product for the first time today thank’s to Sandrea Beauty video (youtube). I already done a list of my future purchase. Received another round of products today. Silver powder has already been used and fully approved! Would LOVE to try another product…this new customer is fully addicted! This toner sounds so soothing & awesome for my skin. Ooh rose water! I am a new customer of the M.B line. I am a lifer now. My skin and I thank you!!!!!!! Yum! Sounds so perfect and soothing for the impending spring and the sunshine it brings, and rose water is one of my favorites. I have just been reading very good things about your product line however I’ve never tried them yet.. hope to soon! Would love to try this! Have been a long time Badescu fan and a long time proponent of it! I have been wanting to try this for so long! I looove Mario Badescu products! I started using your products last year and I keep adding more and more! I have very sensitive skin as well as hormonal issues. Had tried everything it seems like in the Drug Stores as well as Department Stores and Spas. Your products have been the best thing to ever happen to my skin!! Thank you so much!! I want to try this. Mario Badescu products literally saved my skin. I will never use any other product! I recently received a free sample of your products and have raved about them to all my friends! Not only do they work great but they came in such a lovely presentation. I look forward to being a long time customer!! Thanks, again! I LoVe anything Mario Badescu!!! Would love to try this! Mario Badescu products are sublime! OOOh I want this! I just bought back ups of my fav hyaluronic eye cream and glycolic eye cream! I should have picked this up too! I LOVE MB products! Been meaning to try this for awhile, would love to win one. I love facial sprays, I currently use one by MAC, and though it helps with my redness, and is also refreshing, it makes my face too oily. This sounds like something I would love. I had my first facial at your spa recently and it was pure bliss. Thank you for the wonderful experience! I will return for another one soon, and I look forward to trying this facial spray! Best products I’ve ever bought and never switching to any other brand! Try them and you’ll be hooked. Never have tried this product but I’m certain it will not let you down. I would love to try this! My sister uses it and loves it! Mmm! I love rose water scents.. such an awesome summer fragrance. I’d love to try this. would love to try this! aloe rose water and herbs are the best! i havent gotten my free samples of mario badescu .. i tried the products once in a while because of my cousin but i would love it if i coul win this one and get some free sample !! I love MB ! This is the perfect product to use to freshen up when flying so you look refreshed when you exit the airport not like you’ve just flown! I would love to win and try this face spray. I LOVE your products and the ingredients in them or lack there of. This is a great brand and I can’t say enough good things about it. If anyone hasn’t tried anything by them yet I suggest you do. LOVE LOVE LOVE LOVE! Facial sprays are perfect for dry season or dry environments (i.e. airplanes). I love MB products and I’d love to try this out! I LOVE this product! It is so refreshing!!! New product that I would love to try as a free sample. I have seen it but have not tried. Mario is the only company I’d trust to make a facial spray as gentle & effective as a carefully home made version. I know we all say it, but that’s because it’s true: you’ve changed my LIFE, MB. This is one of my favorite products! I am a pregnant girl and would love to pamper myself using this over the hot summer!!! I have yet to try it, but I heard great things about it! I would LOVE<3 to try this spray with Aloe, Herb & Rosewater…so refreshing! I’d love to try the Rosewater Spray! Sounds amazing!! So in love with MB products. I’ve been using them for years now but have finally started ordering directly from MB online. I’m a big fan! Tossing my hat in! Facial Spray come my way! I love Mario Badescu and the Facial Spray is one of my favorites. I have it in the bathroom to set my makeup, in my purse to freshen up or even in the fridige (nice and cooling for hot summer days) I can never have enough Facial Sprays 🙂 I love them! I just recently discovered the wonders of facial spray in setting up my makeup and I would love to try this! It sounds like a very good product! I just recently discovered Mario Badescu! I have not yet tried anything but would love to win this. I’ve heard very good things! Hope it goes back on Hautelook soon!! This sounds wonderful and I bet it smells great too. Would love to try this! Thanks for the giveaway!!! I love MB products, plus the excellent customer service that I receive every time! love mario badescu products 🙂 enter me please! I bet this is amazing. My daughter and I love your products! I would love to try this, I believe it would do my skin wonders. I love MB products and have wanted to try this one! I Would love to try this!!! I sounds amazing!! I have never tried it but I’d love to. Great product. Keeps my skin soft and healthy. I’ve been wanting to try this. Seems perfect for warmer weather. I discovered you last week on Pinterest, I would love to try a product, all the reviews are amazing! Mario’s products have helped my skin feel & look better. I love that people don’t believe that I am 44 years old! I spend a lot of time in the sun & Mario’s products help keep my skin beautiful, moist & healthy. Thank you! Oooh, I would put the Facial Spray in the fridge for a nice pick me up. I bet this spray would be better than a cup of joe in the morning! Wake up Fresh and alert! Bring on my day with this facial spray! I want to win 🙂 tired mommy can use a treat! I have sensitive skin and would love to try this! I’d love to win this and give this a try! I love rosewater, please count me in! I would really love to try this!! I would love to try the rose water hydrating mist. I would take it in my cooler to the beach and get a cool refreshing spritz of rose water to soothe myself from the oppressive heat! I already love the Glycolic Face Wash and the Cucumber Lotion, I would love to continue trying other new products. I definetly love Mario Badescu. I have used many of their products as well as their spa services. I currently use Mario Badescu products and have recommended these to my family and friends. I will continue to use these, because there aren’t any other products that work for me. This would take care of how my skin feels when it gets tight from being dehydrated. HI I would love to try this! Hope I win!! Long time fan of MB products here! I used to live in NYC and get facials at your location. Now I live in So.Cal and order regularly, telling all my friends about it! I’ve been told twice in the last month that I have the skin of a teenager (I’ll be 40 soon). THANKS Mario Badescu – I’m a huge fan! Wow looks like it would be so refreshing! i would love to try yr brand!! Would love to try this! It looks refreshing!